Not getting enough sleep at night can lead to many issues such as having trouble focusing, obesity, heart diseases and diabetes. On average, an adult needs around 8 hours of sleep per night. However, more and more people experience trouble falling asleep or staying asleep during the whole night. While living a healthier life, reducing stress and keeping to fixed sleeping hours can help with mild to chronic insomnia, supplements can also be a great alternative to taking sleep medication. 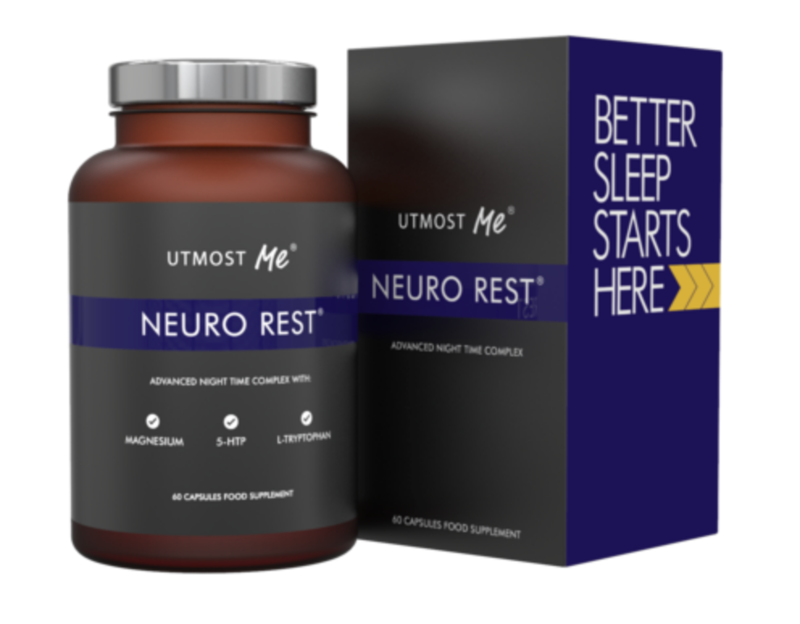 Neuro Rest, a supplement developed by Utmost Me, promises to ease anxiety, help fall asleep faster and enhance the quality of sleep during the night. But does it really deliver? Let’s take a closer look together. Magnesium is an essential mineral that helps convert food into energy and promote the normal function of the parathyroid glands. It also activates the parasympathetic nervous system, which triggers the body and the brain to relax – a state necessary to fall and stay asleep. Naturally, magnesium is present in spinach, nuts, brown rice, fish, meat and dairy. It is estimated that around 70% of people in the UK have a magnesium deficiency. Taking a supplement containing magnesium could thus be fo great help to tackle insomnia. In Neuro Rest, a blend of magnesium is used in order to optimise absorption and efficiency. L-Tryptophan is an essential amino acid which increases the levels of serotonin in the brain. This chemical is a precursor to melatonin, also known as the sleep hormone. Indeed, when melatonin is released by the pineal gland, sleep is induced. Neuro Rest contains 100 mg of L-Tryptophan, which is a moderate dose that may cause side effects for some people. L-Tryptophan is naturally found in bananas, chocolate, milk and eggs. Griffonia seed extract produces 5HTP, which is a by product of L-Tryptophan. 5HTP also increases the production of serotonin in the brain and helps fall asleep faster and having better quality sleep. Neuro Rest contains 90mg of 5HTP, which is a relatively low dosage and should remain safe for most users who do not take any other medication. Neuro Rest includes a blend of fruit extracts designed to promote better sleep quality and can help staying asleep for the whole night. The fruit extracts contained in the Melo Fruit Sleep Cycle Support are first Montmorency cherry, which is one of the few natural sources of melatonin. Montmorency cherries, most commonly known as tart cherries, are also high in anti-inflammatory chemicals and play a role in the breaking down of tryptophan, enhancing its action on the production of serotonin in the brain. Then, the bend contains grape skin extract, which provides healthy amounts of antioxidants and can help reduce blood sugar levels. High levels of blood sugar have been linked to a poorer quality sleep as well as difficulties to fall asleep. You may have noticed yourself that, after eating a bag of sweets or a big slice of cake, you feel more energetic for a while. Grape skin extract also naturally contains melatonin. Finally, the Melo Fruit Sleep Cycle Support includes watermelon extract, which can moderately regulate blood pressure. Watermelon is also high in tryptophan and magnesium. The Mental Wellbeing Blend has been added to Neuro Rest’s recipe in order to further promote sleep by reducing anxiety, providing a mild sedative effect and increasing antioxidants. Chamomile powder does just that and has been used for centuries to that effect, thanks to the presence of the antioxidant apigenin in its chemical composition. Apigenin participates in the onset of sleep. L-taurine is an essential amino acid that has antioxidants properties and acts in a way similar to GABA on the body, calming anxiety and nervousness and thus providing an ideal environment to fall asleep. The following reviews come from Amazon UK. In most users, Neuro Rest should not cause any side effects. It does not cause drowsiness and as such does not leave you impaired to carry out your normal daily activities. However, the ingredients acting on the production of serotonin, such as 5HTP and tryptophan, can induce serotonin syndrome in people currently treated with SSRI antidepressants. If you are taking this type of medication, refrain from using Neuro Rest and consult your GP to find a solution to your insomnia. For the first nights of use, it is recommended to take one capsule 30 minutes before going to bed. This is required as the body needs time to adjust to a new, external source of 5HTP. From the fifth night onwards, take two capsules 30 minutes before going to bed. Neuro Rest is an effective supplement to take in order to treat mild to chronic insomnia. Customers experiencing these symptoms generally report good results within a few weeks of use. However, Neuro Rest does not seem to be very effective when the insomnia is severe. The supplement works even better when users can stick to a sleep routine and go to bed and wake up at the same time every day, as well as refrain from using blue light present on smartphones before bed. Neuro Rest clearly is a great supplement to use when experiencing mild to chronic insomnia. We love the fact that it is made from 100% natural ingredients and uses products known for their effectiveness in inducing sleep and promoting sleep quality. In addition, Neuro Rest does not cause any drowsiness and does not leave you groggy the next morning like sleep medications usually do. However, it is important to keep in mind that Neuro Rest is not suitable for use for people treated with SSRIs, as it can induce a serotonin syndrome which, in some extreme cases, can be fatal. Caution is thus advised when starting to take Neuro Rest. If in doubt, always consult your GP before getting started on a new product. Cécile Gill is a content writer who specialises in fitness and nutrition. She has been an regular gym-goer for several years, both for lifting and fitness classes. Recently she found herself attracted to yoga… and now spends even more time in the gym! Her passion for food and fitness has led her to become a supplement specialist over the years, and she is dedicated to bringing you honest reviews with a scientific approach. Cécile is married to Luc, a personal trainer. Together, they work as a team to bring you the best of supplement reviews, both from a user and a fitness professional’s view. Cécile’s favourite supplements include Magnesium, Omega 3, and PS100.